WORCESTER Wolves director of basketball Ty Shaw blamed poor decision-making as the prime reason for his side falling to their tenth loss in 11 British Basketball League outings at Bristol Flyers on Saturday. A frantic end to the match saw Wolves 77-76 ahead with 45 seconds remaining before the next four points went Flyers’ way. Darell Combs pulled the visitors back to trail 79-80 within the last ten seconds but then watched an immediate Bristol reply. The final play of the evening saw Combs race forward to launch a desperate three-pointer that bounced up off the backboard and left Bristol clinging to an 82-79 success. “We made some terrible decisions, the fight was there but we have to be smarter with the basketball,” Shaw said. Deshawn Freeman set out his stall from the opening tipoff, bullying to his first score and connecting again despite defenders tugging at his vest. 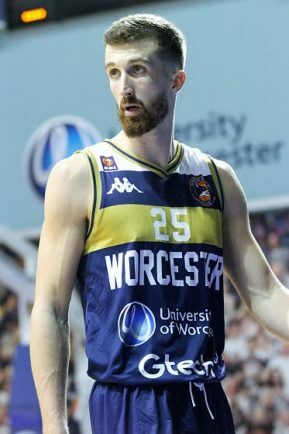 Filip Kramer displayed similar intensity in rejecting consecutive Bristol attacks and Combs floated in a double of three-pointers in a confident Worcester start. Captain Adam Thoseby notched a trio of baskets to keep his side in touch at 34-40 by half-time. Things began to turn in Wolves’ favour after the interval. Thoseby sank a triple and then dispossessed his opponent to find Freeman who threw down a stunning windmill jam to level matters at 42-42. A bullet assist from Thoseby to a wide-open Kramer had Worcester enjoying a 59-54 advantage entering the final quarter. More Thoseby sharpshooting brought a large bunch of travelling fans to their feet in celebration of the lead maximising at 64-54 but it now became Flyers turn to shine. Balls were nudged out of Worcester men’s hands, players failed to get shots away inside the permitted 24-seconds and suddenly the match was tied again at 64-64 with five minutes to go. Bristol point-guard Jalan McCloud repeatedly sliced through Wolves’ defences to rampage to a highly-impressive sixteen points in the remainder of the game and set up the thrilling finale. Thoseby and Freeman led the Worcester scoring on 20 points apiece, with the latter also grabbing 15 rebounds. Combs and Robert Crawford both posted 13 points. Wolves will return to action on Friday (December 7) at the Manchester Giants and Shaw believes the break will give his squad the opportunity to rest and reflect. “We’ve had guys playing heavy minutes. They definitely need a break and the chance to get their legs underneath them,” he said.